We were delighted to receive a #RISE2017 ‘Vision & Sustainability’ Award for the Lower Royd radical ‘whole house’ retrofit last week. The award is a reflection of our commitment to exploring innovative solutions for hard to treat buildings with solid walls and developing our ‘whole house’ methodology for retrofits, using Passivhaus Planning Package. We have finished the main bulk of the building work at Lower Royd now. Our clients moved back in about two months ago. There is still a fair amount of second fixings needing to be done and there was a delay with the kitchen arriving, so they are still settling in and finishing off the internals. This final blog shares some of our concluding thoughts on the project alongside any lessons learnt. As we mentioned in a previous blog, our IWI strategy at the project involved around 100mm thickness of Diathonite Evolution IWI, which was applied 25 mm at a time. Diathonite Evolution is usually applied at thicknesses of 30 – 60 mm. Our aim is deep retrofit to around the Passivhaus retrofit EnerPHit standard, which will be the standard necessary for a lot of the retrofit in the UK if we are to meet the challenges of climate change. This means wall U values of around 0.35 W/m2K and an insulation thickness of 100 – 125 mm. So, Lower Royd has been a testbed for Diathonite Evolution in the UK for deep retrofit, at this thickness. There has been quite a bit of interest in our work. AECB researchers have installed 17 moisture Omnisense sensors in the walls and Leeds Beckett University’s Centre for the Built Environment are also undertaking heat flux tests on the walls. This work has kindly been funded by Diasen, the manufacturer of Diathonite and their UK distributor, Ecological Building Systems. The Diathonite has created a natural and softly rounded finish, which has helped create a beautiful building. We really like Diathonite as a natural, airtight, robust IWI solution, which is capillary active and vapour open. The thermal conductivity (0.045 W/mK) of the Diathonite is great. However, during the project we have become aware of a significant disadvantage of the product used for deep retrofit at this thickness which is the slow rate of drying out. In fact …the walls are still drying out. Diathonite cures much more quickly compared to conventional NHL plasters, but given the depth installed and the already moist conditions of the walls, combined with the material being applied during the winter season the timescale for drying out the walls has created challenges. 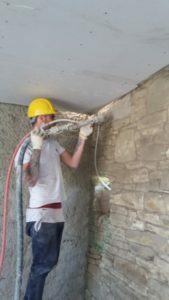 We applied Diathonite Evolution to the barn walls in the summer of 2016 and the farmhouse in November 2016 – no ventilation was in place during this period. The MVHR and heating have been on since February 2017. Given the volumes of water required to apply a screed and the Diathonite, at the building stage in an airtight house, MVHR will not provide adequate ventilation to exhaust the moisture. When we added humidity sensors in the house in February 2017 we found that the relative humidity was 85%, whereas a normal house might have been at 60% and a Passivhaus around 40%. Even though the heating capability is oversized (with underfloor heating on ground floor and radiators on the first floor giving three times the designed heating load of 4.4 KW), we couldn’t get the internal temperature above 14C because of the drying out process. We had to use two dehumidifiers, the MVHR going and heating on for a couple of weeks to get down to the levels at which to do second fix joinery. We can see no practical way that we could have avoided either the installation of windows into such a high humidity environment, nor gypsum plasterboard and plaster, so this humidity really does make the sequencing of the building process problematic. In our case, of course, our clients did not plan to move in for many months due to further finishing works, so we were lucky in this case. 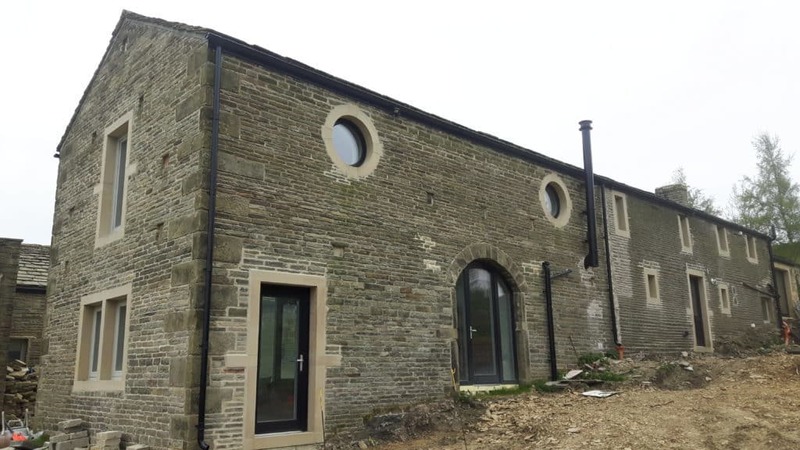 We are, of course, very familiar with masonry construction and building airtight, having pioneered Passivhaus construction in the UK at Denby Dale, and later Golcar. So we know that moisture in the fabric can result in elevated relative humidity for the first year at least after construction. This was exactly what we experienced at the Golcar Passivhaus with relative humidity sitting stubbornly at around 55% for the first year, before eventually dropping into the 40s, which is where we would expect it to be from our experience of Passivhaus. At Lower Royd the relative humidity is still at around 62%, so we think the drying period will continue for a while, with higher U values in the short-term, as with all damp masonry constructions. The walls now are dry to the touch, and have been decorated with breathable (vapour and capillary open) lime-based paints. The Omnisense sensors will tell us the picture over the long term, and at present are telling us that the walls are still drying out. Apart from the drying issues, we really like Diathonite Evolution. Costs seem comparable with other high performance products, like Tectem or wood fibre, which might be suitable for this sort of construction. We loved the simplicity of Diathonite, with relatively simple spray application. There are real benefits to the Diathonite because the wall is levelled and insulated at the same time. Many of the other suitable IWI systems available require a lot of wall preparation beforehand. The beauty of Diathonite is that it can be applied to uneven walls without levelling or parging. From a moisture risk point of view we’re extremely happy with the Diathonite – because of its capillary and vapour openness. 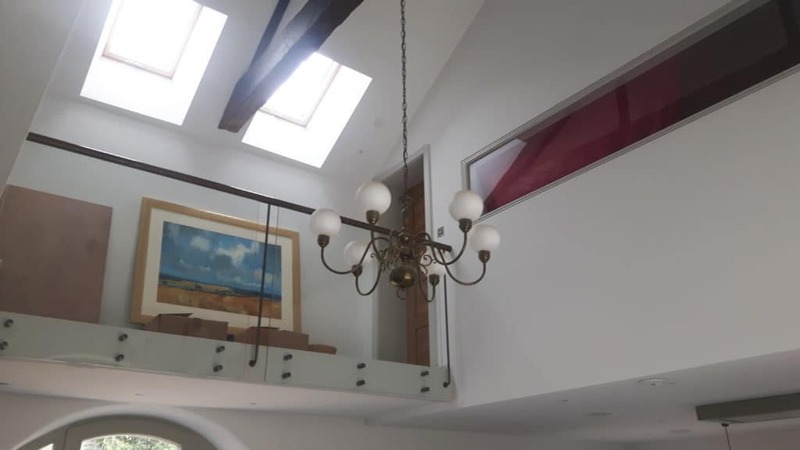 The combination of cold solid walls, high exposure, driving rain and the potential for interstitial condensation mean that any IWI system used had to be extremely robust in its ability to deal with moisture and inhibit the risk of mould growth. While woodfibre is extremely diffusion open and has a degree of capillarity, mineral insulation systems such as Diathonite or Tectem are much more capillary active and inherently more resistant to mould, therefore offering significantly higher levels of security in more extreme conditions. It was interesting to note that during our period of very high relative humidity, while we had some mould growth on gypsum plaster and timber, we had nothing on the Diathonite surface. As a result, I feel completely at ease with both Cumberworth and Lower Royds projects regarding the risk from interstitial condensation and mould. We have thought about using an exterior brick cream, as recommended by the manufacturer, because this would stop most of the Pennine rain getting into the wall, We know brick creams are going to be important in some UK retrofits on solid walls because they make the wall surface repel moisture. But we feel that the way the Pennine stone walls were constructed was deliberately designed to keep water away from the inner skin of stonework – the exterior skin was laid with stone canted slightly outwards, while the rubble fill acts as a way of allowing water to run down without reaching the inner skin. We do have some concerns about brick creams and their longevity over the longer term, so would prefer not to rely on them where we are not sure they are needed. Of course the Omnisense sensors and monitoring will tell us over time whether we are correct or whether we should use brick cream. If we do, then we will go back and do it later (and probably write another blog about it). So watch this space. I would definitely consider the use of Diathonite at this thickness in a similar situation, although I would want to carefully assess the impact of the prolonged drying period on the project. We now understand the risks of interstitial condensation when applying high levels of IWI to solid walls in retrofits especially for exposed locations with a lot of rain driven moisture. For a high exposure location with porous solid wall stonework I would now find it difficult to use a solution which did not offer the same vapour and capillary open qualities as Tectem or Diathonite. It’s about recognising and assessing the risk. It may be argued that the EnerPHit standard for U values for IWI is too onerous, and that a lesser thickness of insulation would be justified. Building regulation provision for example, outlined in Part L1B5.12, indicates that a value of 0.7 W/m2K can be accepted for the upgrade of existing walls where it might not be technically practical or economically feasible to improve the U value to such an extent. We think that this needs to be considered bearing in mind our legal and moral commitment to mitigating climate change, and the CO2 emissions from our building stock. Our Building regulations are clearly not fit for purpose, but for some buildings, combined with high levels of airtightness there may be a ‘sweet spot’ somewhere between the EnerPHit and Part L1 values. With hindsight, we should have covered the windows better to protect them from the Diathonite spray, which has meant we are now having to re-paint some of them. 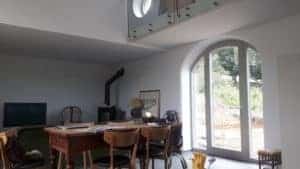 Ecological Building Systems, the suppliers, advised that the Diathonite should be applied before the windows were installed if possible but that did not prove practical in an airtight project where we’re taping the windows. I would just caution others using Diathonite to make efforts to protect any window frames more carefully. When we started on the retrofit we did not commit to get to EnerPHit standard but I was privately hoping that the project would get there. We achieved 1.4 ach @ 50 Pa which is very good and effectively about 8 times better than the value in our current building regulations for new build, but unfortunately not quite good enough to meet the EnerPHit standard requirement of 1 ach @50 Pa. Thanks to thermal imaging cameras we were able to identify where things went wrong. 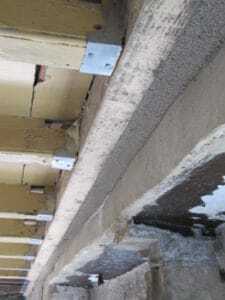 We found air leakage in the barn behind the intermediate floor timber wall plate. This detail had been carefully fixed with Compacfoam away from the wall so that we could minimise thermal bridging and optimise our airtightness strategy. 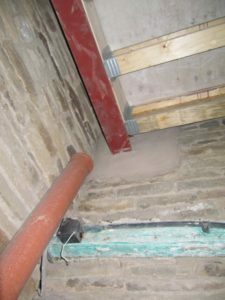 It had been fixed in such a way to allow the Diathonite to be sprayed behind the wall plate – to allow continuity of insulation and airtightness. However, we now realise that the spraying process didn’t get enough in the gap provided. The process of spraying the Diathonitewas just not suited to filling fiddly spaces– it’s very sticky (like icing) and it just wouldn’t go into the gap well enough. Fortunately it was only in the barn that this problem occurred but the area affected is the equivalent to 6m2. In the second Diathonite spraying phase in the farmhouse we filled the gap behind the wall plate by hand. If we were doing this detail another time we would copy what we did in the farmhouse and fill the space behind the wall plate by hand with a trowel and poke it down into the space so it’s absolutely packed in. Hopefully, these are useful lessons for others using the product. 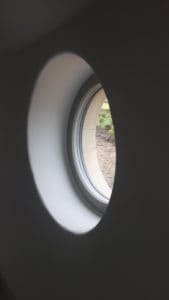 We’ve been delighted to yet again trial an innovative and useful IWI solution and develop our radical ‘whole house retrofit methodology further. 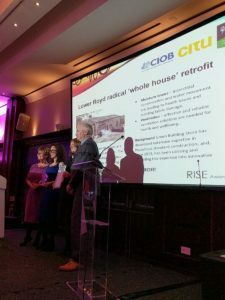 We were also thrilled to have been recognised by the RISE Awards for our ‘Vision and Sustainability’ in seeking to find solutions to the technical challenges of retrofitting hard to treat solid wall buildings.. Watch this space for any updates on further academic research and monitoring of the project! Thanks Bill, this raises some really important issues with IWI for which we have yet to arrive at a failsafe solution. I will watch with interest the long term development of this study building. I appreciate your candour in discussing the challenges encountered in such an open and accessible forum. It is a great example of best practice dissemination. 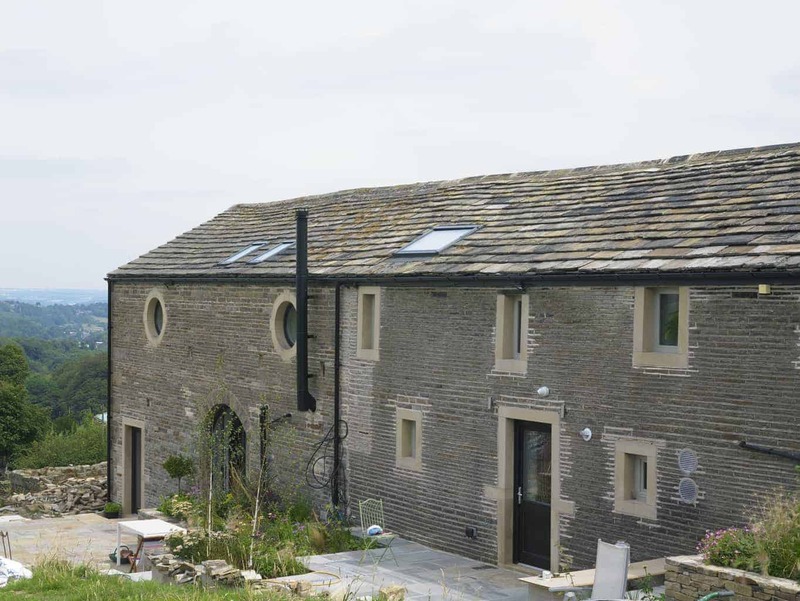 FREE technical resources on 'whole house’ radical refurbishment of a Yorkshire farmhouse and barn using innovative internal wall insulation (IWI) techniques.